What is the difference between AF-A, AF-S, AF-C and MF focus modes on Nikon camera’s. When should you use AF-A, AF-S, AF-C, MF. When you set your camera lens to AF (auto focus), digital SLR cameras offer the photographer a choice between interchangeable modes. Auto focus modes can vary between different digital camera brands. In the past, Nikon’s two most popular modes were called Continuous Servo AF and single area AF. Nowadays, they are called AF-C (short for auto focus continuous) and AF-S (short for auto focus single). Many Nikon models also have AF-Aand MF (manual focus) modes to choose from as well. What are the differences between AF-C, AF-S, AF-A and MF focus options? AF-C (AF continuous, sometimes called continuous servo) is good use when photographing moving objects. When your camera is set to AF-C and you focus on a moving subject, for example a dog running towards you, the focus will stay on the animal so long as your shutter button is held half way down. In other words, the camera will keep re-focusing as the animal moves. That is, so long as you keep your shutter button held half way down. AF-S (AF single, sometimes called single area AF) mode, is good for photographing subjects that don’t move, such as flowers or portraits etc. It locks the focus on the non moving object that you want to photograph. You can then recompose the shot and take the photograph. AF-A is where the camera selects and goes between the last two modes. If it thinks the subject you are photographing is stationary, then it will automatically use AF-S focus mode. If it picks up that the subject you’re photographing is a moving subject, then it will automatically use AF-C focus mode. This is also the default camera focus mode, unless you change the setting to AF-C or AF-S.
MF is the manual focus mode. It’s unclear why this focus mode is included, because nowadays there is usually an option to switch between auto and manual focus on the side of the actual lens. Maybe it’s in case you come across a lens that doesn’t give you that option. Why would photographers change between focus modes? The default camera setting is AF-A. As mentioned earlier, this mode guesses if the subject you are photographing is stationary or moving, and accordingly sets the focus to either AF-C or AF-S. Photographers don’t always trust the camera to pick the correct setting, preferring to make the choice themselves. You can now follow the assignment below for a lesson on how to switch between focus modes, with a Nikon D40. Other Nikon models are similar. However it’s best to refer to your camera manual if any steps below don’t quite add up. Assignment: A lesson in using your Nikon camera’s focus modes. In this lesson you are going to learn how to use AF-C, AF-S and AF-A camera modes. All these focus settings are only available when the camera lens is in auto focus mode. Therefore, your first step is to look on the side of your lens and change the switch to AF or A (as its shown on some lenses). You will also need to turn your top dial to a setting other than AUTO. For this example, set it to P for program. This setting will give you the option of choosing between all 4 focus modes. 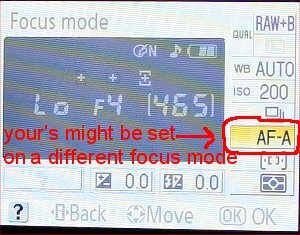 How to change the focus mode between AF-C, AF-S and AF-A? Press the info button on the top of the camera, then press the <i> button on the lower back near the LCD display. It should bring up the information screen, as seen in the LCD display. Now use the up down left and right buttons near the Ok button to highlight the focus mode. You’ll know it’s highlighted when it turns yellow. Then press ok and you will see a screen where you can choose between all 4 focus modes: AF-C, AF-S, AF-A, and MF. Set the focus mode to AF-C, then photograph a moving object. For example, someone walking towards you. Focus on the person by pressing your shutter button half way down (keep it down until you take the shot fully) You should notice the camera re-focusing as the person moves. The important thing here, is to not release the shutter button. You need to keep it pressed half way down, then when your ready to take the shot, press it down fully. Now set the camera’s focus mode to AF-S and photograph a stationary object. Notice this time, it focuses once. For the third exercise, change the focus mode to AF-A and photograph both a moving and stationary subject. You’ll soon notice, the camera doesn’t always guess the setting for the moving subject correctly. Hence the reason why photographers like to choose focus settings for themselves.